bloofoxCMS is a free open source content management system (CMS). bloofoxCMS is a small and easy to use CMS. It enables you to manage websites and intranet sites on a very simple way. It is slim but also flexible. You may use and download it free of charge without any limitations. But it would be a great pleasure to receive a small donation. Very easy installation over web browser by using an automated install process with only 2 steps. If you prefer a manual setup just use our SQL dump files. 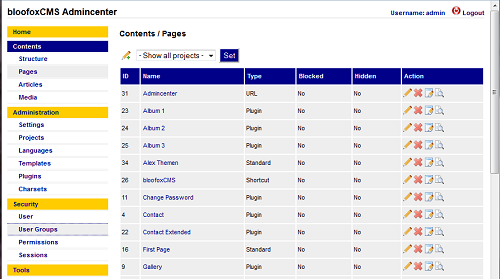 Easy to use admin panel with structured areas. You need only a short training period. The Admincenter includes an intuitive user interface. More simply and fast expandable program code also for PHP beginners. Every php developer is able to extend the code with additional individual code lines. Fast customization und creation of individual template designs with HTML or XHTML and CSS (cascading stylesheets). Our templates are completely free of PHP code. Even web designers without PHP knowledge can create templates.